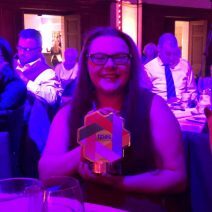 Wythenshawe Community Housing Group (WCHG) is delighted to announce that Lucy Marshall scooped ‘Inspirational Young Tenant of the Year’ at this year’s Tenant Participation Advisory Service (TPAS) awards 2019. Born and raised in Wythenshawe, Lucy is a founding member of the Wythenshawe Youth Forum, a group that gives young people a voice in their community. Lucy has always been an example for others to follow and has been involved in various community activities from a very young age. Lucy is inspired by her own ability to help young people. She has a natural flair to engage children and young people from all backgrounds and is seen by her peers as someone who will listen, not judge and even give sound advice. Lucy shows a maturity beyond her years in that she also has an ability to help young people find their own solution to their issues. This is the second year running that WCHG has won this category at the event, which is also testament to the fantastic work the WCHG Youth Team is making in the area.